Weighed down by guilt following the death of his two-year-old son, Mac McCann accepts a year-long position training police officers in Afghanistan. Leaving his wife Sophie to grieve alone, he hopes the life-or-death distractions of his self-imposed exile will build a wall between him and his pain. As camaraderie builds between Mac and the men on base—including a local barber and his precocious little boy—Mac’s heart becomes invested in stories beyond his own tragedy and he learns he is not the only one running from loss. But when the hour of attack arrives, will he be able to see past his guilt to believe there’s still something—and someone—worth living for? 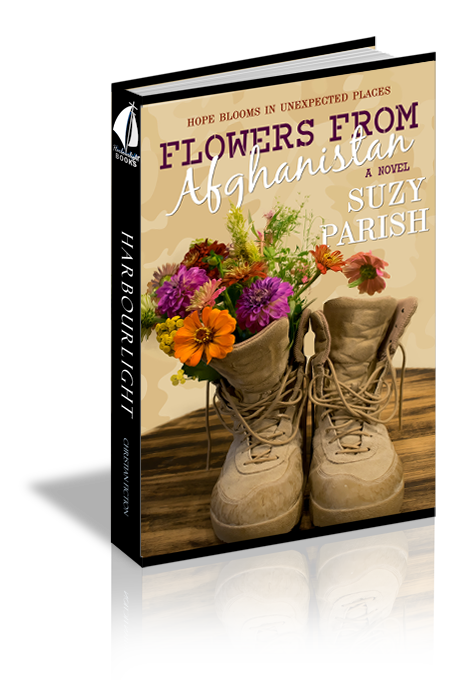 With touching details based on true events, Flowers from Afghanistan is a redemptive journey of healing, a chronicle of hope in crisis, and a testament to the faithfulness of God through it all. I crawled over to the table, slowly, slowly, calling his name until‒“Gotcha!” I threw the sheet back and grabbed him in my arms, tumbling and tickling him until his laughter bounced off the walls. “Wait until tomorrow. You’ll have more time,” Sophie said. If I’d listened to her, things would be different. I ignored her request and scooped him off the floor, dressed him in khaki shorts, a blue T-shirt, and red sneakers. My little man was going for a haircut at the same barbershop all my fellow police officers on first shift frequented. “We won’t be long,” I said. “If you won’t listen to me, then at least take a picture of us before you go. I’ll miss these curls.” She wound her finger around a bit of his strawberry blond bangs and kissed his forehead. Sophie hugged Little Mac into her lap. I found my son’s favorite toy on the end table and handed it down to Sophie, trying to center their faces on my phone. “Say, Pumpernickel!” The name of that bread always made Little Mac laugh. “Pump-a-ni-coo,” he repeated in his squeaky voice. Little Mac’s face spread into another of his infectious grins. The dimple on his left cheek deepened as he spun the pinwheel. The blue blades threw glints of light onto the floor and ceiling. He clutched the plastic toy to his chest like it was a treasure. I bought it for him when Sophie was still carrying him in her womb. I was amazed it survived two years of his rough play. He graduated to toy cars and building sets, but the pinwheel was still his favorite. I snapped a picture, a light flashed, illuminating the room. They were frozen in time on my phone. I’d won the argument but wasted precious time. The barbershop was only four blocks away, but it closed in thirty minutes. I scooped Little Mac from Sophie’s lap. I stopped mid-step at the door. “Will do,” I said, blowing Sophie an air kiss. I hurried outside carrying Little Mac, letting the screen door slam behind me. Lightning flashed in the west. I pulled away in a cloud of dust. Little Mac kicked his feet against the back of my double cab truck seat, in time to his favorite song. I sang along, though Sophie wouldn’t have called it singing. I put on my turn signal and stopped at the red light. When I hit my brake, my cell phone slid across the front seat. I grabbed it, and as I did, a text message flashed. My breath caught. It was the name of a first shift dispatcher who’d sent me on most of my calls. I thought I’d made it clear when she approached me at my going-away party. I wasn’t interested in any relationship outside my marriage. I fumbled with the button to erase the message. Out of the corner of my eye, a flash. The loud bang of two vehicles colliding reverberated in my head, then grinding metal on metal. Airbags deployed. I coughed and blinked to clear my eyes of the white cloud that filled the truck. Smoke? Are we on fire? No, it’s powder from air bags. Red lights flashed. No siren. No traffic sounds. Only the fear-filled bass of my heart and my own ragged breaths. It seemed to take forever to reach the ambulance. I tucked Little Mac’s small body against my chest. Focus. A few more feet. I ran until I threatened to push my lungs and legs past their limit of endurance. I handed my two-year-old son off to the waiting paramedic and jumped in the back of the ambulance with them. Later all l could recall was his hand, so tiny, grasping my sleeve as if he were trying to do his part, too. I continued to sort my equipment into piles to pack. Socks, underwear, T-shirts. A plastic bag held my body building supplements. Sophie paced around my gear in the living room, her hands fluttering, clenching and unclenching. Question 1: If you only answer one question of these ten, this is the most important: Have you ever made a conscious choice to surrender ownership of your life to the Lord Jesus Christ? Question 2: What did dust symbolize in the book? Question 3: What did the Burn Pit symbolize? Answer 3: The burn pit is a reference to Gehenna, Topheth, or "the valley of the son of Hinnom." All of these names refer to Hell. When Phoenix the puppy is found in the burn pit, he is covered in ashes; representative of Mac’s emotional and spiritual state, exiled and without hope. Mac is covered in the ashes of his guilt. He has sentenced himself to his own hell, a war zone. Just as Mac pulls Phoenix from a dark lonely place, so God will soon rescue Mac. Question 4: What did crumbs symbolize? Question 5: In what way did water play a symbolic role in the book? Answer 5: Mac washes the ashes off Phoenix after he rescues Phoenix from the burn pit. This is a redemptive scene that foretells Mac’s later salvation. At the end of the book Mac is in the shower and watches dust spiral down his arm and down the drain. Water gave a visual representation to Mac of God’s ability to forgive his sin. This was the turning point for Mac, and he walked out of the shower a new man. Question 6: What role did pinwheels play in the story? Question 7: "Like a three-stranded rope that’s been sawed through until there is only one strand left. I hung by that strand, and Sophie wielded the knife. A knife I’d given her.”~Mac What did the three-strand rope represent? Question 8: The loss of a child is unfathomable pain to someone who has not walked that path. What was Sophie's reply when Mac asked where God was? Question 9: The real life Mac was saved from injury when he moved ahead alongside the wall. His buddy behind him suffered an injury and survived. Have you ever felt guilt over surviving a situation when a good friend did not have things work out as well? Answer 9 Ultimately when we belong to Christ, we acknowledge that everything that comes into our life is filtered through His hands. If you are a parent you have probably experienced a time when you had to take your child to a doctor or dentist and you knew it would involve pain. You, as the parent knowingly let your child be subjected to that experience, understanding it was for the better. In this way, God sometimes allows us to go through painful experiences when there is no apparent reason. Faith asks us to trust He does all things well for us, even if we won’t understand the reasons until we are united with Christ in heaven. Question 10: The scripture written inside of the real-life Mac’s running shoe was a true event. The attack occurred while he was in his running shoes. Have you ever seen God’s provision in a way you never could have predicted?